Too Many Penises at Fargo’s Ecce Art Gallery? The Ecce art gallery in downtown Fargo has been called out for featuring about twice as many male artists as female ones. Someone recently noticed this flyer pasted to the gallery’s window. 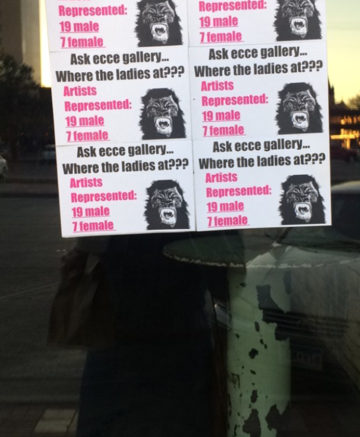 It reads, “Ask ecce gallery… Where the ladies at?? ?” and says seven female artists are represented at the gallery, compared to 19 male artists. The gorilla on the poster suggests it’s the work of the Guerilla Girls, an anonymous activist collective combating male dominance in the art world since the 1980s. So … what is Ecce’s male-to-female artist ratio? We did our own calculation. We only looked at solo shows, and used Ecce’s Facebook events as our data points. From the first show on March 11, 2011, to present, we counted 56 solo shows. Seventeen of them featured a woman and 39 featured a man. Several artists had multiple shows. We counted 19 unique male artists and 11 unique female artists. We reached out to Ecce owner Mark Weiler for comment, but instead of answering our emailed questions, he asked us to come into the gallery sometime “to discuss.” We’re not interested in visiting the gallery, but we’re happy to publish any response he writes us. Be the first to comment on "Too Many Penises at Fargo’s Ecce Art Gallery?"